why I read it: I loved the movie, have been meaning to read it for a while. first things first: Geisha are not prostitutes. they are not home-wreckers, they are not call-girls, they are not exotic dancers. 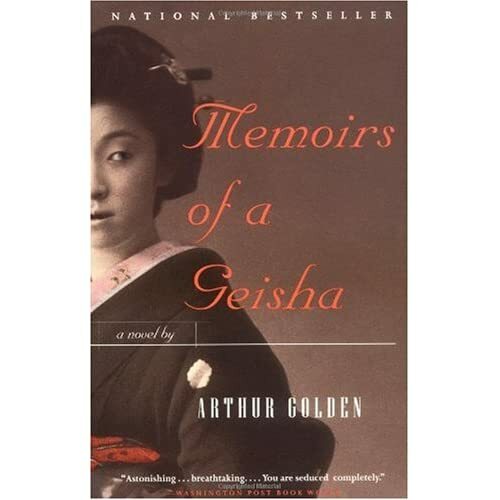 If you’re having even the slightest difficulty grokking that, Memoirs of a Geisha probably isn’t the book for you. Or perhaps it’s the perfect book for you. With her parents no longer able to support her, Chiyo and her older sister are sold to a broker of sorts, who arranges for the girls to be taken to Kyoto. Perhaps they will be maids their entire life, perhaps geisha, perhaps something else. Chiyo finds herself at nine years old as a maid in an Okiya alongside another girl named Pumpkin. Coming face to face with Hatsumomo, the Geisha of the okiya, Chiyo learns fast that her life will take one of two paths: become a geisha, or be a maid for the rest of her life.